The story of the "Hello Girls" truly is Women's History. There are two ways it qualifies: it is the story of women moving into new areas of involvement, including warfare; but it also involves a 60 year-long battle to finally gain veteran's status and, even then, not conferring it upon the majority who had died. My own reenactments as Oleda Joure Christides have shown the spotlight primarily on Michigan's telephone operators. Here I've shared the story from this region, which included the Chicago district. The women were all young and on an international adventure they normally would never have expected. Because the reactions from the Chicago operators are clearly common to "Hello Girls" I want to be sure and give it, too. 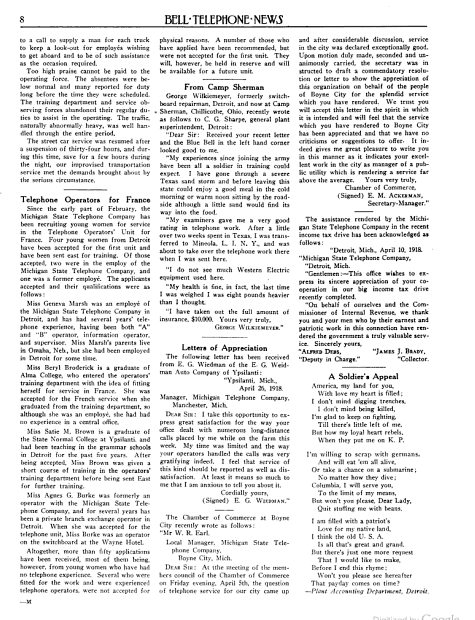 While I have limited ways to change the reproduction here of the articles from Bell Telephone News, today's articles all are from Volume 9 and each of the items given this month from the corporate periodical are free e-books from Google Books. I heartily recommend their volumes for a look back into how the business world viewed women differently. 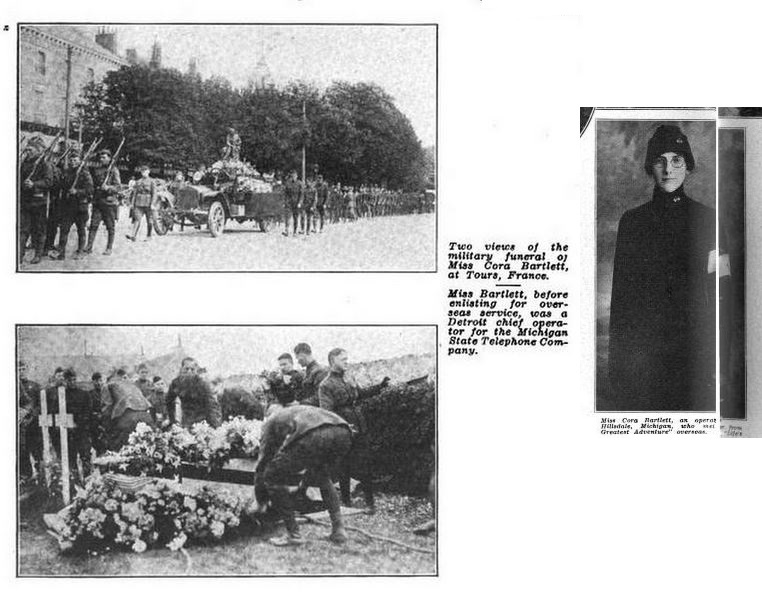 Articles about administrators and also the men who became soldiers are very different. Social news related to women today would be considered slanted toward trivial matters. Additional articles are about fashion, even including some patterns, and homemaking topics. 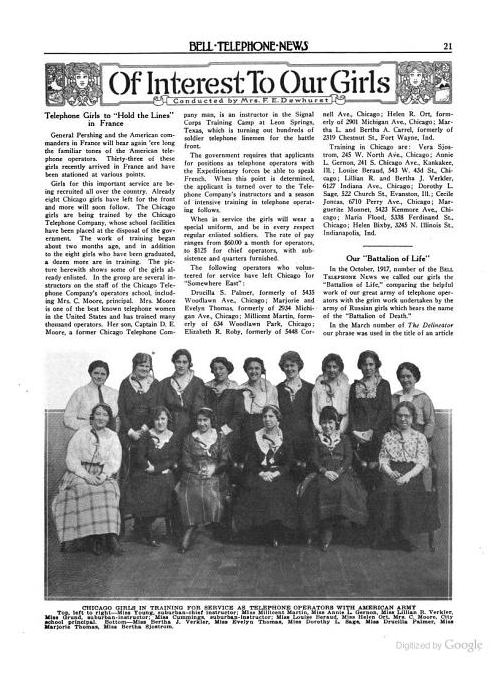 There's the section titled "Of Interest to Our Girls" -- yes, today we would say "Women", but beyond that the tone and topics reflect another era, although articles, among the many "Conducted by Mrs. F.E. Dewhurst", about the returning operators show a glimpse into their world and include reactions you might expect from young soldiers of either gender. Beyond that, I found interesting September of 1919 has an article glimpsing the changing world of the 20th Century, "Labor Must Turn Deaf Ear to Bolsheviki, I.W.W. and Socialist Cure-Alls." Notice that headline to an article below my second article about influenza and both articles also mention illness or quarantine. Spanish Influenza was a two-year worldwide pandemic stretching from 1918 to 1920 killing the unlikely population of those same young adults in the war, unlike the usual mortality among more vulnerable age groups. Of course, while the disease wasn't just on the battlefield, wartime conditions were perfect for spreading the disease. 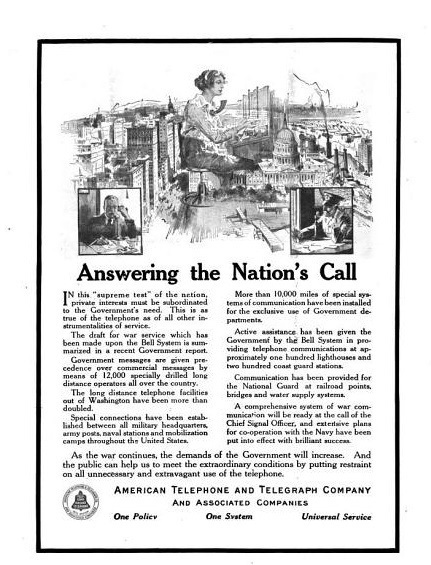 Bell Telephone, the predecessor of AT&T, here in Michigan and Illinois produced a periodical, "Bell Telephone News", for their workers. 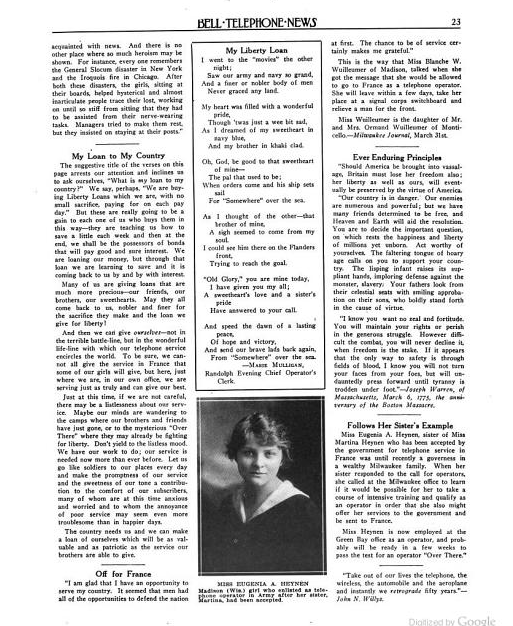 Each of these articles are part of a larger scan available online from Google Books. 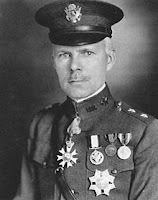 Today's articles are in response to General Pershing's call for bilingual telephone operators. It was a year after we entered the war. The attempt to work with the existing French telephone service was impossible for the soldiers on the battlefield, complete with long delays and interrupted service. Remember that until mid-20th century all calls had to go through phone operators. Here in the U.S. we were able to have 14 phones for every 100 households, while in France it was only 1.5. 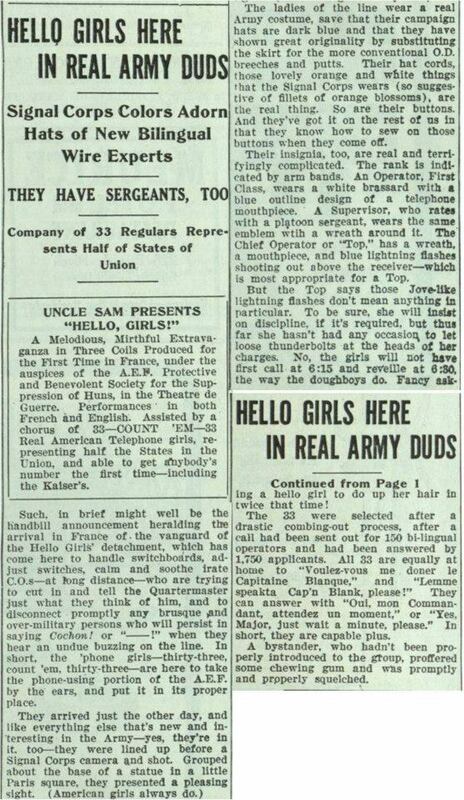 Signal Corps men were quite willing to run and maintain phone lines, but switchboard operation was "women's work." If that sounds sexist, scanning the old issues is a different world since it was a time when the highest supervisory post available to women was training operators. 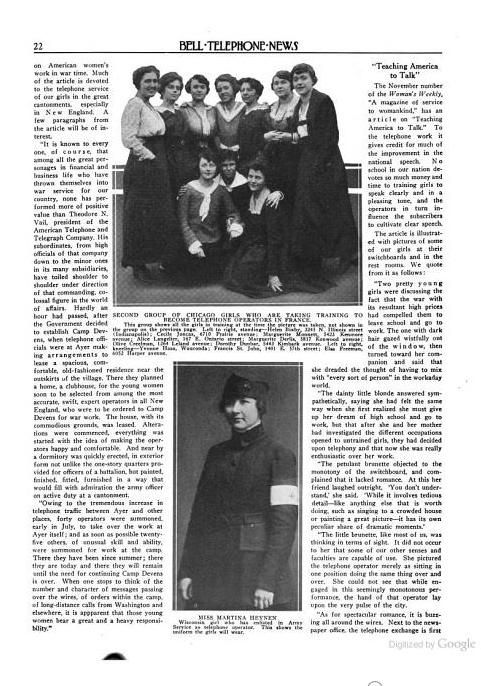 Bell Telephone News, vol 7, no 9, April, 1918 p 237.